The Nut Feeder is a fun refillable toy! 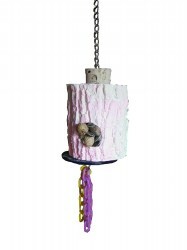 Just pop off the cork and fill it up with your birds favorite treat. The nut feeder comes filled with peanuts, millet and sunflower seeds. Your bird can enjoy chewing on this calcium enriched treat dispenser. Approximately 3 1/2" tall and 3" in diameter. Attaches easlily with a quick link.